Frater Jordan S. Neeck, O.Praem., ’11 (center) with Deacon Brad Vanden Branden, O.Praem., ’09 (left) and Frater Jacob Sircy, O.Praem., ’09. The Rev. 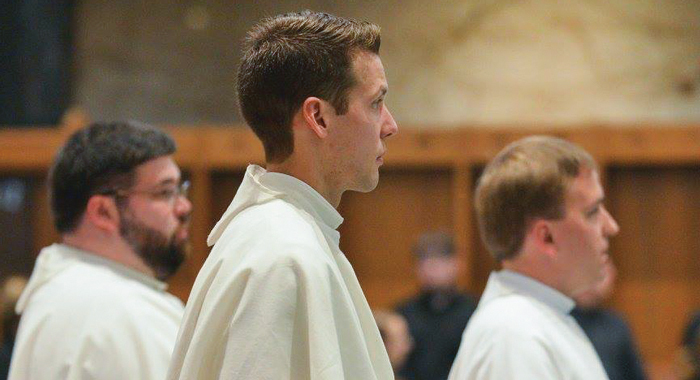 Matthew Dougherty, O.Praem., ’09 was ordained to the priesthood on June 6 of last year. The ordination of Deacon Brad Vanden Branden, O.Praem., ’09 followed in August, and there are more to come. A group of young men – many among them St. Norbert alumni – have answered the call to serve, providing an influx of vocations at St. Norbert Abbey, and its independent daughter abbeys in Pennsylvania and New Mexico. What drew these young men to religious life? 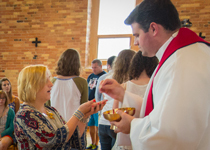 “I was impressed by the humble service and dedication to ministry that I witnessed in the lives of the Norbertines involved in both the campus and a variety of other ministries,” says Frater Mike Brennan, O.Praem., ’99. Norbertines in formation pursue programs of study, but also have the opportunity to serve when they return to their home abbeys. Vanden Branden is ministering as a deacon at St. Ann Parish in the Archdiocese of Chicago. Sircy assists with the Rite of Christian Initiation of Adults (RCIA) program at a parish in Chicago. Brennan has been doing nursing home and hospital ministry in Chicago. When back in Wisconsin, he serves at St. John the Evangelist Homeless Shelter and Notre Dame Academy in Green Bay. LaPacz is in Ministry Practicum at Franciscan St. Margaret Health in Hammond, Ind. He serves in the spiritual care department for eight hours a week. Neeck spent his second year of novitiate at Our Lady of Lourdes Parish and School, De Pere, and at Green Bay Correctional Institution. Haney serves as caretaker of the Santa Maria de la Vid Abbey church, assisting with preparation for liturgies. He also expects to be placed in a modest part-time RCIA ministry at one of the New Mexico parishes, as well as in liturgical ministries at the abbey’s other parishes. Matthew Dougherty points to an early experience at St. Norbert College as a spiritual renewal and the start of his path to the priesthood. He had neglected his faith in high school. “I rediscovered it during my freshman year of college after meeting a couple guys who lived down the hall from me,” he explains. “Through their friendship and example, I grew in my faith while in a community context.